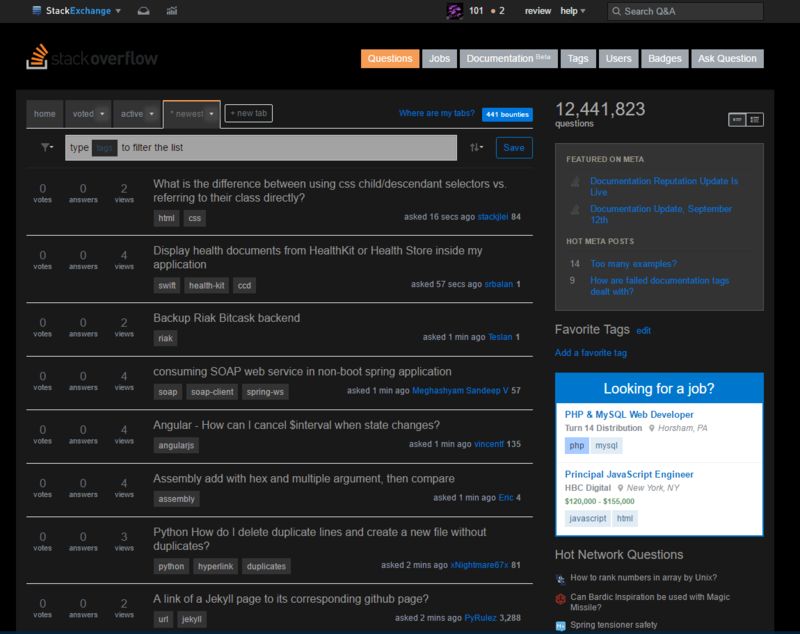 Most sites on Stack Exchange are pretty bright, with a lot of light colors. This causes eye strain and makes SE somewhat painful to use at night, even with F.lux or Redshift installed. Is there something that will turn SE sites dark, so they're a little less blinding? Since this has bothered me so much, and (understandably) the development teams for each site probably wouldn't be too thrilled at rewriting the stylesheet, I've decided to make my own userscript that injects a specific CSS file, depending on the current site. 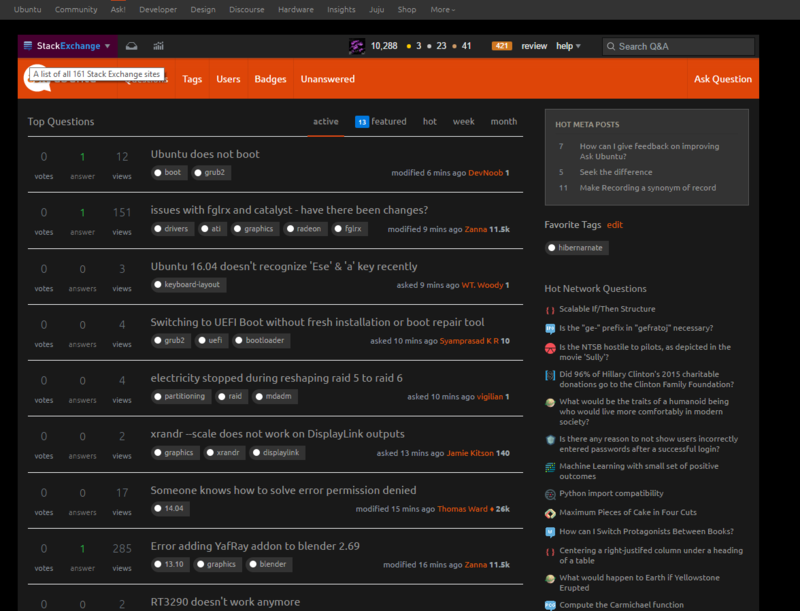 As of now, I have Ask Ubuntu (my home site), Stack Overflow and Chat.SE mostly complete. There are a few bugs and weirdly colored areas, but for the most part, they work fine. Of course, this is only three sites on the SE network, but I'm planning on adding more. They could obviously use some work, but that's one of the reasons I decided to post this. Since it seems like there are at least 54 people who like the idea of a dark theme that works well, I wanted to share this. I also want to reach out and, frankly, ask for help in the form of suggestions, code edits, or new additions: a community-built dark theme for any added SE site. I'm really hoping this is well-received (if not, oh well; people are terrified of MetaSE for a reason :p), and that I/we can create good-looking dark themes to complement the lighter default style of most SE sites. The GitHub repository, which includes installation instructions, can be found here. I hope everyone enjoys this (enough for some people to help me out maybe ;) ).